In the debate to determine the greatest catcher of all-time, Johnny Bench often comes out on top as he paired offensive power with tremendous defensive skills like never before. He led the Cincinnati Reds to the World Series four times, capturing two titles, and emerged as one of the Reds' fan favorites in the process. Many of the best Johnny Bench baseball cards are highlighted in the list that follows, including some of the most iconic cards from the 1970s. Shop for Professionally Graded Johnny Bench Cards on eBay. After two seasons in the minor leagues, Bench rocketed to stardom in his rookie year, hitting .275 with 15 home runs and 82 RBIs. He was named the National League Rookie of the Year and became the first catcher to ever win the award. Bench also became the first rookie to win a Gold Glove award and it would be the beginning of ten consecutive Gold Gloves between 1968 and 1977. 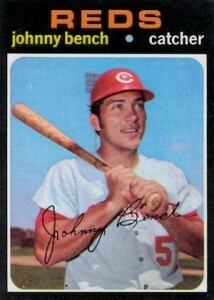 Johnny Bench continued the white-hot start to his career by winning the 1970 National League MVP. At 22 years old, he was the the youngest player to hoist the award. His stat line that season included an impressive .293 batting average with 45 home runs and 148 RBIs, and it helped propel the Reds to the first of four World Series appearances. Bench repeated as the National League MVP award winner two years later by smacking 40 home runs and 125 RBIs. While the Reds would again take the National League pennant, they couldn't capture the World Series title. It wouldn't be until the Big Red Machine claimed back-to-back pennants in 1975 and 1976 that Bench tasted victory in the World Series, leading his team to titles over the Boston Red Sox and New York Yankees. The Yankees series saw him earn the World Series MVP, which was the icing on the cake of a legendary career that culminated with a first-ballot Hall of Fame induction in 1989. 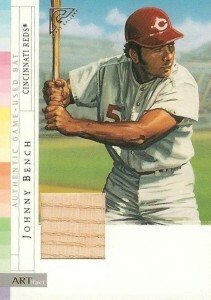 On the cardboard front, one of Johnny Bench's first baseball cards can be found in a series from Milton Bradley in a 1969 baseball board game. Featuring black-and-white photographs, the cards are very basic with the major league logos removed, and only the player's name on the front of the card. It is easily one of the most budget-friendly Bench card from his first few years in the league. 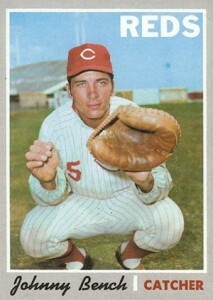 Beyond the cards covered below, there are still plenty of other notable Johnny Bench cards. 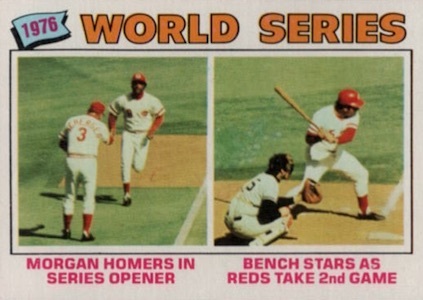 In 1992 Upper Deck, Bench and Joe Morgan were featured in the Baseball Heroes insert set. The Baseball Heroes checklist spans many years and Upper Deck sets and the Bench cards include numbers #37 to #45. Collectors can also find the Baseball Heroes cards on the bottom of the wax boxes, creating an interesting variation for fans to track down. Adding even more to the equation, Morgan and Bench co-signed 2,500 copies of a duo card which would have been included in the list had it been a little easier to track down. As many of the greatest players of the 1960s and 1970s were retiring in the 1980s, it became common for the three major card companies of the period to create cards honoring their careers. Cards in 1982 Donruss and 1982 Fleer honor Bench and Tom Seaver, who were briefly teammates. In 1984 Topps, you can find a "Superstars" card with Bench, Carl Yastrzemski, and Gaylord Perry, while 1984 Donruss and Fleer have cards honoring Bench and Yaz. Along with being a beloved player, Johnny Bench's baseball card appearances include some of the best action shots seen on cards from the 1970s. As such, cards from this decade are heavily covered below. In building this top list, overall value was a main component, along with the card's design and historical importance. 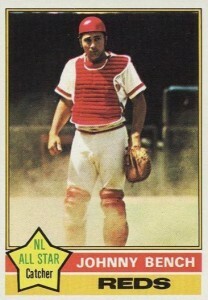 We begin the list of amazing Johnny Bench cards with one from 1976 Topps that seems to have just missed the action. The dirt is still flying in the air as a result of a possible collision at home plate, and by the look on Bench's face, I'm pretty sure the runner was safe. It is certainly one of the top cards in the 1976 set. 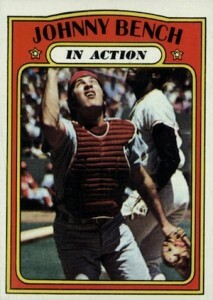 Bench's success in the 1976 World Series is highlighted in this 1977 Topps card. Bench was the World Series MVP, hitting above .500 over the course of the series. 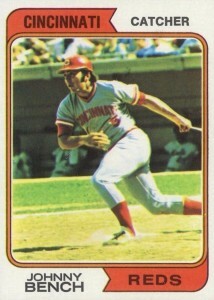 It also features Big Red Machine teammate Joe Morgan who played alongside Bench from 1972 to 1979. Besides featuring one of the most memorable Bench photographs from his canon of baseball cards, Johnny's 1974 Topps card back reminds us that Bench was once an aspiring country music singer. He appeared on the TV variety show Hee Haw singing a song called "Oklahoma Morning" in honor of his home state. Johnny Bench autograph cards are regularly included in modern baseball sets, such as 2015 Topps High Tek and 2016 Topps Legacies, however, they are typically difficult to pull. Collectors are more likely to find a Bench relic and a particularly nice hit is found in 2003 Topps Gallery featuring an original painting in addition to a bat relic piece. The back of the 1971 Topps Bench card calls him a "future Hall of Famer," which was certainly bold for a player who was a 23-year-old at the time but Bench would back it up. He was selected for his first All-Star game during his rookie season and would make the team each year through 1980. In their 1972 set, Topps included In Action cards of several players and they were featured directly after the player's base card on the checklist. The Bench base card shows him in a posed batting stance while his In Action card has him straining to locate a pop-up. This might be the prequel to his famous 1973 Topps card that is covered in the next listing. 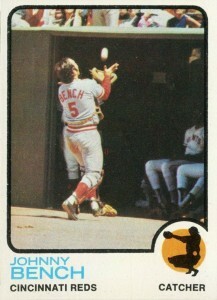 My personal favorite Johnny Bench card can be found in 1973 Topps as they included a perfectly timed photo of Bench catching a foul pop-up and nearly ending up in the San Francisco Giants' dugout. In the seconds before the photo was taken, Bench has thrown off his catcher's mask and is precariously close to tripping over a misplaced glove as well as the dugout steps in order to make the catch. Bench's appearance in 1970 Topps is a part of the high-numbered series, making it one of the hardest cards to find in the entire set. 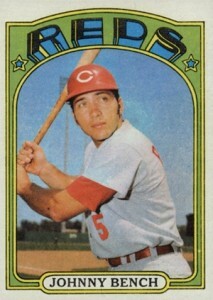 Collectors can also track down an All-Star card for Bench in the 1970 Topps. Either of these cards in high grade sit near the top of his card list for overall value. Johnny Bench played a handful of games in the 1967 season but few enough to still qualify as a rookie during the 1968 season. In his first full season, he claimed the Rookie of the Year award, a Gold Glove, and a trip to the All-Star game, quickly making him one of the biggest stars in baseball. 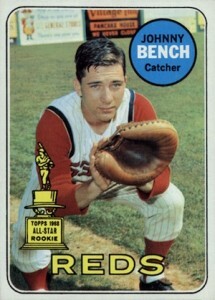 Bench has two appearances in the 1969 Topps set: a base card with the famous All-Star Rookie Cup and an NL All-Star card. Both are a nice alternative to his more-expensive rookie card. 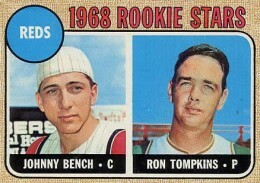 Bench shares his rookie card in 1968 Topps with teammate Ron Tompkins who never pitched a game for the Reds. 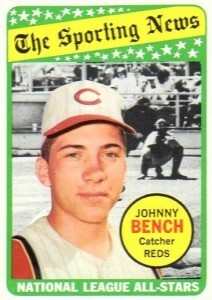 Rare for cards of this era, Johnny appears with his baseball cap turned around. Bench's first Topps card is the second most valuable option in the entire 1968 set, only bested by Nolan Ryan's rookie card. Near-mint graded copies can surpass $800 at auction. 1978 Topps Johnny Bench Cincinnati Reds #700 Baseball Card 5.5! Beckett!